Last year at the BlackBerry Developer Conference in San Francisco, Adam Nash, Vice President of Search & Platform Products at LinkedIn, announced that LinkedIn for BlackBerry was in the works and even provided a few screenshots. Since most business professionals use BlackBerry as their mobile platform, this announcement was highly anticipated by BlackBerry users. Tonight, the business social network finally launched the official LinkedIn for BlackBerry app and it is now available for download online and at the BlackBerry App World store. According to the LinkedIn blog, the app supports only the BlackBerry Tour, Curve, and Bold devices that are running BlackBerry OS v4.3 or later. As a BlackBerry user and a LinkedIn member, I was excited to get my hands on this app and I’m sure this will be a very popular app in the professional arena. 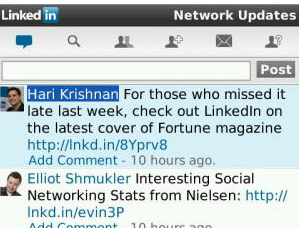 Although the LinkedIn for BlackBerry app is not as feature-rich as the iPhone app, it does just about everything you need it to do and a little extra. The app features six key modules: Network Updates, Search, Connections, Invitations, Messages, and Reconnect.